It is easy, and tempting, to see the eighty-two-year-old Leonard Cohen’s magnificent fourteenth album as a farewell. As is often the case with Cohen, though, it is not quite that simple. ‘You Want It Darker’ may seem to be the singer’s farewell to his life, his work, to us, but throughout the album the nature of his goodbye shifts, and we are never sure exactly what or who he is saying goodbye to. The key might lie in a strange case of repetition. Cohen, an artist renowned for spending years on his lyrics (he allegedly spent five years writing ‘Hallelujah’) has chosen to give us a repeated line and a repeated image in two of his songs. The line is about departure from a game and the image is about the extinguishing of a flame. It seems extraordinary that Cohen should do this and I think we can rule out carelessness or oversight as a possible reason. Why, then, are these lines and images repeated, and why might it be significant? ‘I’m out of the game’ is a pretty clear image of quitting, but quitting what, exactly? The first thing that comes to mind, obviously, is a game of cards – hence the dealer and hence the table. But othermetaphorcal games, other dealers and other tables are also suggested – the table at which you sit with a lover and the table at which you might sit with someone else and break bread and drink wine. So is it the game of life, the game of love, or is it the game of belief and faith? The same can be said of the ‘flame’. Is it the light of life, is it the hot flame of love and sexual desire or is it the illuminating flame of belief? 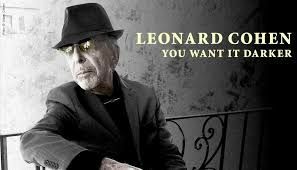 Those who know Leonard Cohen’s work will recognise the rich ambiguity of his lyrics, the psalm-like simplicity of the language.They will also be familiar with the depth of his voice. On ‘You Want It Darker’ both the voice and the language become deeper and more profound – it’s like someone talking from beyond, some ancient, wise prophet teasing and tantalising with simple yet gnomic utterances about love, life, faith and mortality. Particularly puzzling is the ‘you’ of the title and the ‘you’ of the songs. All the songs, bar one, are addressed to ‘you’ but, as with the nature of the game and the flame, it is never quite clear who this ‘you’ is. It could be us, his audience, (making the title an interesting challenge – you want it darker, you’ve got it), it could be himself (‘you’ as the generalising pronoun standing for ‘I’), it could be God or it could be an unspecified love or lover. Whoever the ‘you’ is, though, there is always an issue, always an argument – mistrust, suspicion, struggle, betrayal. What Cohen is searching for is summed up in the title of one of the songs – ‘Treaty’. Whoever he is addressing – God, his lover, himself, us, faith – has let him down ( ‘I try but I don’t get high with you’) and he is hoping for peace, for reconciliation between ‘your love and mine’. Biblical and religious imagery have never been far from Cohen’s songs but on ‘You Want It Darker’ they assume a whole new dimension, becoming absolutely central to the album’s power and effects. Cohen quarrels with God and Faith as if he quarrels with a lover and it is difficult to pin down his position with any precision. Does he believe? If so who or what does he believe in? Who is he talking to? Who or what does he love? Who is he blaming or accusing? It’s like listening to the struggle of John Donne’s divine sonnets – Cohen’s heart is being given a good battering and so is the listener’s. And yet the effect is curiously uplifting. ‘You Want It Darker’ may be an intensely religious, spiritual experience posing, but not answering, the big questions, but it is soothing and pleasurable to listen to. Synagogue choirs, yearning strings, backing female singers accompany the deep, questioning voice – the overall effect offers the consolations of religious ritual.